1. Having a messy home. I am not a neat person, I have never been a neat person. Before I had kids, I would find every reason not to clean. Sure, I had plenty of time (though I probably didn’t realize it at the time), but I would rather do almost anything else than dust or scrub. When family and friends would come over, I’d definitely get the look of disapproval and wonder about how I have not managed to pick up a broom. Now that I have kids, it’s not a mess, it’s “memories.” Toys strewn across the floor are just signs of a joyous household. Piles of laundry are accepted with a smile, and a “you have your hands full.” I have no idea what I will do once the kids are grown up and they are no longer destroying the house. I am a punctual person, even after kids. Before I had them, I probably would be about 30 minutes early, now, I am usually just on time. However, most parents will agree it is difficult to never be late when you have a brood to schlep. Sure, I might be a little annoyed if you are late for a play date, but I’ll get over it fast. That could easily be me the next day. If you don’t have kids, however, prepare for an epic level of side-eye if you fail to show up on time. Just one of you to get ready? You better be 10 minutes early. Before kids, it looks bad if you constantly bail on brunch or cocktails. I get it, sometimes you just want to watch nine hours of Game of Thrones and be left the hell alone. Sorry, but without kids, that excuse won’t fly. You just end up becoming the lame friend who never wants to do anything. This applies to you regardless of your relationship status. Throw a kid in the mix, and all of a sudden you are a responsible adult. Wanting to ditch late-night cocktails to spend time with your little ones makes you a wonderful parent, even if you have said “no” the past dozen times. The only acceptable time to eat congealed mac n cheese at 11 p.m. is when you are in college, or when you are a parent. Trying to keep the kids fed is an endless cycle. Three meals a day? Mine have three meals before lunch. No amount will satiate the hunger of these little beasts. Us parents, are often left satisfying ourselves with whatever scraps our kids have graciously left behind (read: lots of stale bread crusts). 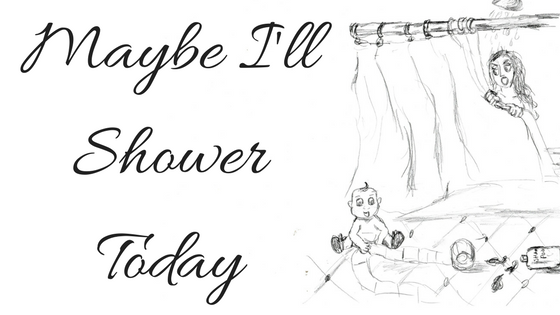 I don’t know a single person without kids who would openly admit to not showering daily. Despite no evidence to suggest it is necessary, and may even be detrimental to your health, a good scrub a day is considered normal. That is unless you have kids. Not only can you get away with not showering for a day or two or three, you can freely lament your lack of cleanliness. You can even join the ranks of several bloggers, self included, who have made a cottage industry out of the need for more than 30 seconds of privacy. Managing to keep an outfit clean for more than an hour is as much a milestone as getting your kids to sleep through the night. I have yet to do both, and I have been a parent for more than three years. Even if you are away from you kids, stains seem to find you like some sort of heat-seeking missile. If your clothes do manage to escape the inevitable, snot, poop, ketchup or grass stain, chances are they haven’t been washed in a while. If it looks clean, wear it. It is one of those great mysteries as to how I can have so much laundry yet wear basically the same thing everyday. Kids are hard, that’s why parents can get away with so much.